Our on-campus events are a great way to help you decide what to study and to show you our fantastic facilities. Chat to Course Coordinator, Jeff Corkill about ECU’s Counter Terrorism, Security and Intelligence courses, flexible study options and your career goals. Tour WAAPA's world-class facilities and venues to see how we put on a great show. Find out why Teaching’s popular at ECU and experience our well-equipped School of Education. Help for students and parents in choosing subjects for Year 11 and 12. While eating pizza. Thinking about a Business course or studying Law, or maybe both? Don’t miss this session. Tour our Arts Hub and experience the fabulous facilities for students in these disciplines. 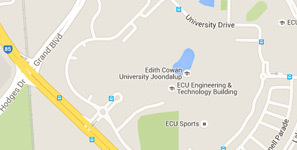 Discover why our School of Engineering has some of the best facilities in Australia. Explore these distinctively different disciplines at our world-renowned academy. For international students in Perth – covers courses, entry requirements and plenty more. Discover why our School of Nursing & Midwifery has some of the best facilities in Australia. Discover our exciting and diverse range of study options and world-class facilities. For psychology graduates who’ve shown they are ready to go to the next level.